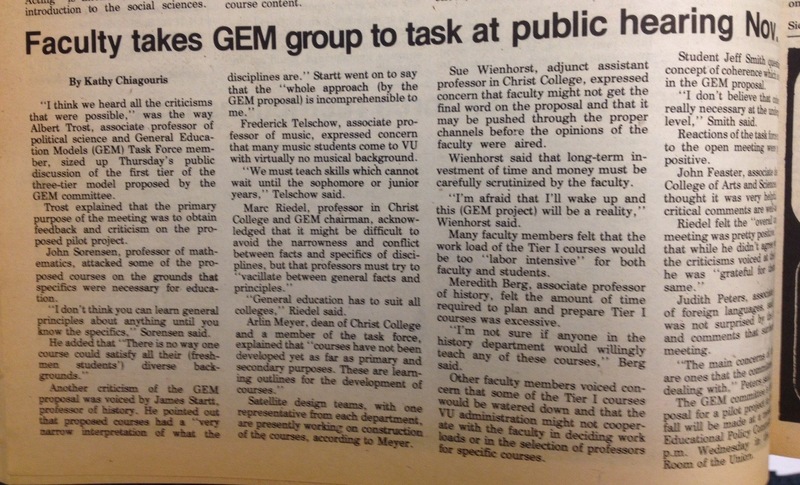 My first-ever published newspaper articles! Those who ask me about the potential value of extracurricular activities for college students risk being on the receiving end of a verbal serenade about The Torch. Allow me to explain…. 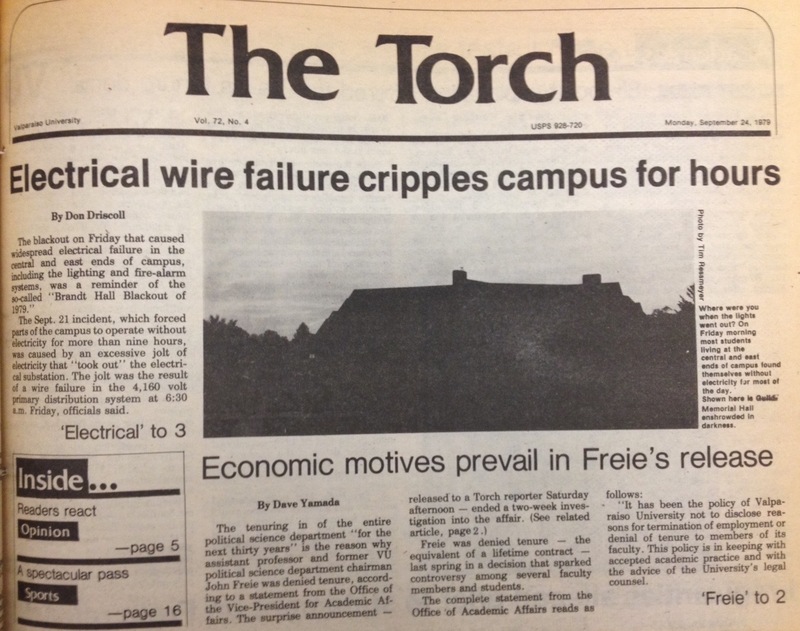 My undergraduate alma mater, Valparaiso University in Indiana, recently announced the creation of an online archive of past issues of The Torch, the school’s long-running weekly student newspaper. 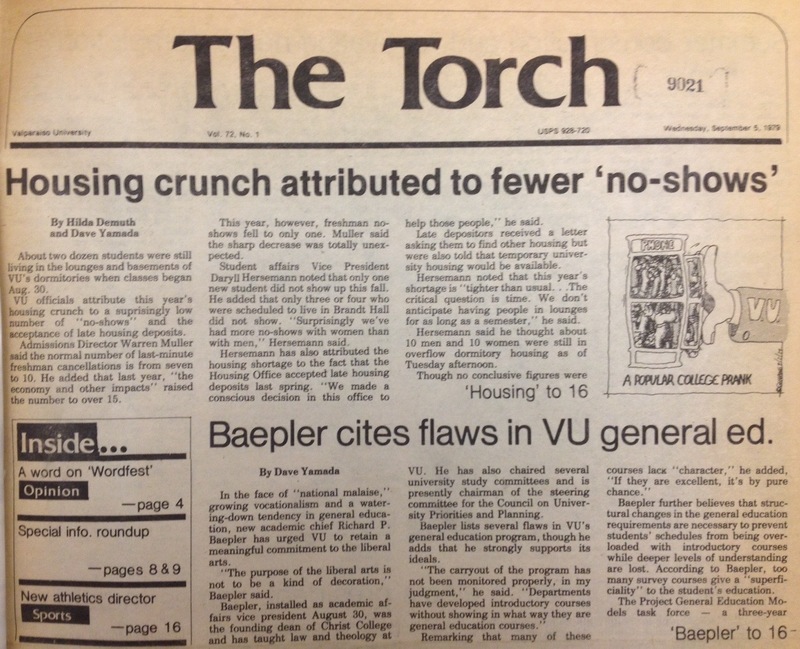 As a former Torch department editor and reporter (1979-81), the notice catapulted me into a nostalgic state. I even dug out the bound volume from my first year on the paper, photos of which you may peruse here. I quickly lapse into soggy memories over The Torch because it was the most important extracurricular activity of my college career. The experience of writing and editing articles for publication has paid professional dividends throughout my career, and many of the friendships formed with fellow staffers have endured to this day. I joined The Torch in my junior year, and I pored myself into working for it. I wrote dozens of articles and columns, mostly on academic affairs topics within the university. I also assigned stories to reporters in my department and edited their work. Some articles demanded special attention to detail, thoroughness, and accuracy. For example, I wrote an investigative piece in which I was able to elicit admissions from campus administrators that a popular political science professor had been denied tenure on grounds beyond the official criteria for tenure evaluation. This meant many hours interviewing university faculty members and deans; our reporting had to be airtight on such an important matter. I also did a series of articles covering the aftermath of a tragic student-on-student slaying that had racial overtones. Those pieces thrust me well beyond the comfort zone of reporting everyday campus events and activities. For several weeks I was regularly on the phone with sources from police departments, the county prosecutor’s office, and the local hospital, among others. The Torch quickly became the social and intellectual hub that I didn’t previously have at Valparaiso. 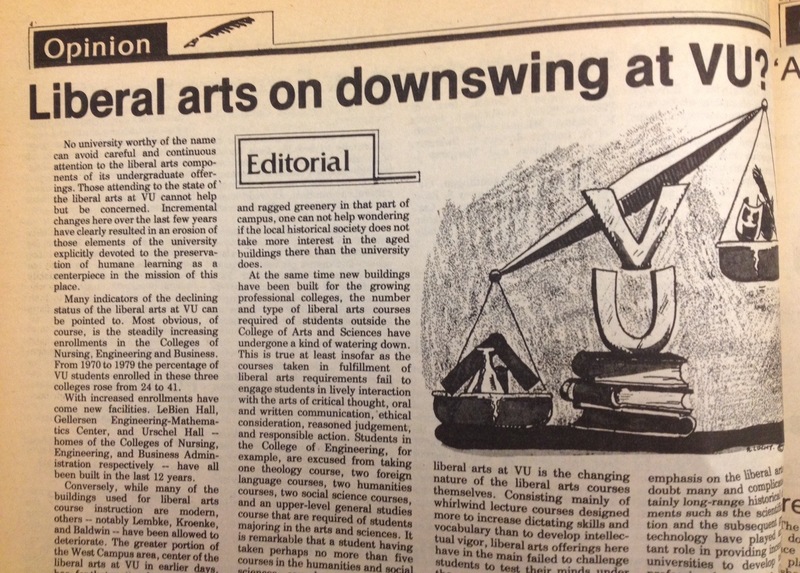 A former Torch colleague once wrote that it became our own college of sorts, where we wrote and edited our articles and debated issues related to academic and campus life. We spent a lot of time simply hanging out at The Torch offices, even when we didn’t have to be there. Looking back, I now realize that it was an exceptional extracurricular experience. Our little newspaper was not free of sophomoric writings (some penned by yours truly), and at times we took ourselves too earnestly (ditto). But we produced some quality reporting and thoughtful commentary about collegiate life and academic institutions, as evidenced by multiple awards we earned from the Indiana Collegiate Press Association during those years. The university’s Greek system was a regular focus for us, and we often took to task the behavioral excesses emerging from fraternity events. This was the age of Animal House, and along with toga parties inspired by the movie came some pretty egregious conduct. 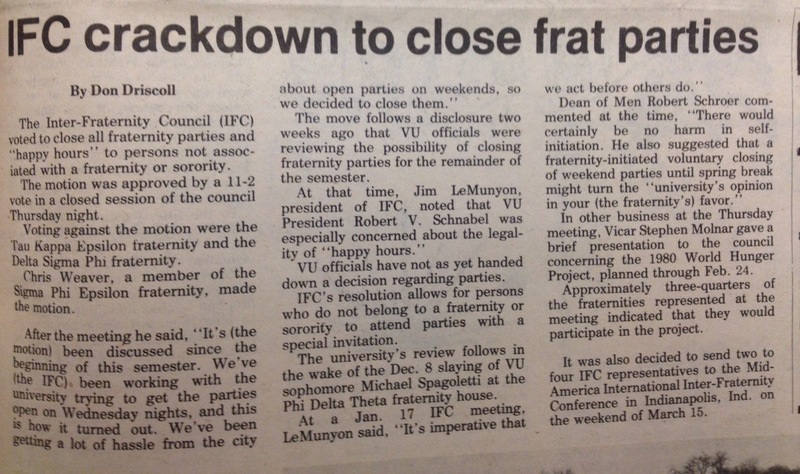 In retrospect, it’s clear that we were fully warranted in addressing these issues, many of which anticipated today’s concerns about student conduct at fraternity events. However, we largely dismissed the positive social bonds facilitated by fraternities and sororities. Our office conversations were laced with regular putdowns of Greek organizations, to the dismay of Torch staffers who belonged to them. 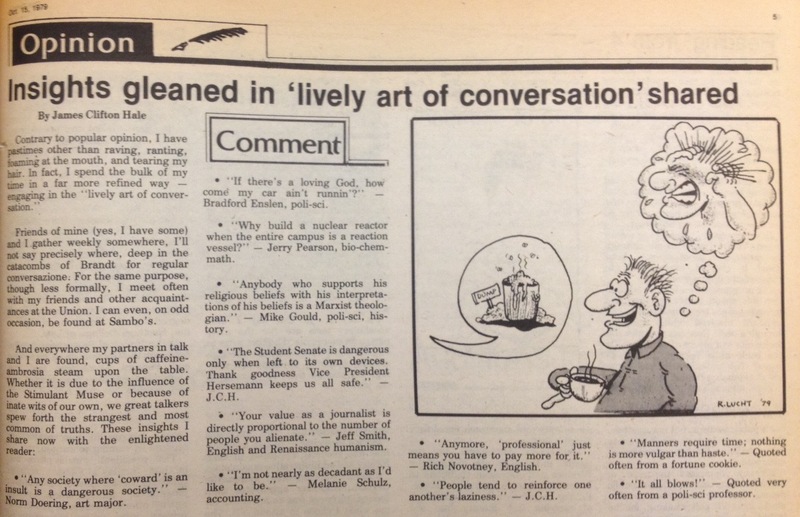 At a school with a largely conservative student body that embraced the Greek system, our newspaper was a liberal-ish, independent enclave, sometimes fueled by healthy doses of self-righteousness. As a group of (mostly) liberal arts majors, we closely reported campus deliberations relating to the place of the social sciences, humanities, and general education in the university curriculum. These topics were frequently invoked in editorials and opinion columns as well. The more callow among us were guided by the work of three senior editors with strong intellectual orientations. Many of us were unaware that we were participating in an emerging national debate on the value of instruction in the liberal arts, but this troika was already marking academic trends by reading The Chronicle of Higher Education. Only a handful of Torch staffers would build careers in journalism. One of them, Jim Hale (author of the “Insights gleaned” column pictured above), is currently a reporter for the Gettysburg Times in Pennsylvania. Previously Jim was a writer for the Gettysburg College communications office and a reporter for the Chesterton Tribune in Indiana. As for me, I did some part-time reporting for a couple of local newspapers in northwest Indiana, and later I served as an editor of the law school newspaper at New York University. Though I did not pursue a journalism career, The Torch served as an ongoing tutorial on the importance of tight, clear, well organized writing. In terms of aspirations, at least, these qualities have manifested themselves in virtually everything I write: Scholarly articles, essays, reports, op-ed pieces, and, yes, blog posts. In fact, I know that my affinity for the blogging medium traces back to my days at The Torch. Writing this blog is an engaging pastime for me, like being a newspaper columnist, albeit with a much smaller readership! Writing my professional blog, Minding the Workplace, requires more analytical smarts, but it, too, has roots in my collegiate newspaper experience. The old chestnut about understanding your present by comprehending your past certainly applies here. I did not have an academic career in mind when I was a collegian. My intention was to go to law school and eventually to start a career in politics. (I also was active in student government and in political campaigns as a college student.) However, as I flipped through the pages of The Torch, I understood how reporting on the ups and downs of academe planted seeds that keep sprouting in my life today. Equally important, I remain good friends with everyone whose byline appears in these photographs, as well as others who were part of the mix. Our paths cross regularly through periodic get-togethers, e-mails, phone calls, and social media. Many of these friendships have matured and deepened over the years. This only reinforces my belief that something good was happening at that campus newspaper office some 35 years ago. Portions of this post were adapted from a previous piece on the importance of extracurricular activities, written for Minding the Workplace.